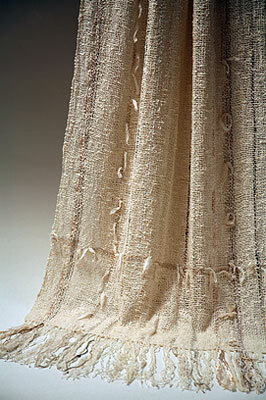 This elegant wedding shawl is handwoven in a plain or "tabby" weave. An ivory toned "Queen Anne's lace" cotton is combined with neutral colored silk, dyed cotton and rayon ribbons with a touch of fawn colored tencel (a wood pulp fiber). The shawl is one-of-a-kind and hand washable for easy care.